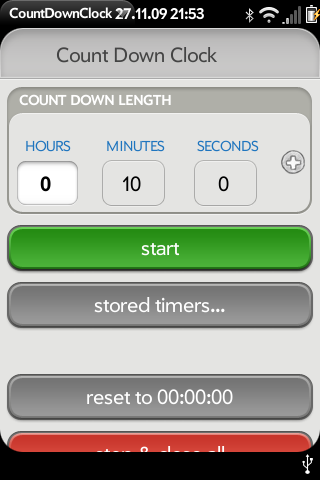 CountDownClock is a small but powerful count down timer. It supports multiple timers (count downs), can store timers for reusing and gives a short alert when the timer is reached. I wrote this because my last mobile had a count down timer which I used when I parked my car in the parking garage. It has one hour free. As I found nothing similar on webOS I wrote it. V1.2 allows disabling of the dash sound.